-Note- I used a contrasting color for rows 4, 35, 38 and around the leg holes. Slip stitch to Join the last and first stitch from the previous row. This will make it a circle instead of a flat piece. Row 14-25 : CH 1, Turn. HDC into each stitch around, Join to top of the first HDC. Row 26: CH 1,turn. HDC into the next 2 stitches. CH 8, Skip 8 stitches. HDC into the next 20 stitches. Row 27: CH 1, turn. HDC into the next 2 stitches. HDC into the next 8 Chains. HDC into the next 20 stitches. Row 28-31 : CH 1, Turn. HDC into each stitch around, Join to top of the first HDC. Row 32: CH 1, Turn. **HDC Two Together. HDC into the next 8 stitches. Repeat from ** 3 more times. Row 34-37:(make sure you are working with the nice side of the stitches on the outside of the sweater) CH 1, **HDC into the next stitch. FPDC over the next stitch. Repeat from ** around. HDC around the leg holes. Attach yarn into one of the stitches of the leg hole. CH 1. – One HDC into each of the 8 stitches, each of the 8 Chains, and 2 HDC into the side of the HDC on both sides. (20 HDC) Repeat for other leg hole. I love this. Thank you for sharing it free. I have lung cancer and I’m working on a wave blanket queen size for my daughter & her kids right now but want to make this for my minature schnauzer. I’m going to add some chains as she weights more than this. Thank you again I love getting your emails. This count is not working for me & I can’t figure what I’m doing wrong. At the end of row 6 I have the 38 stitches. When I finished row 7 I had one extra stitch, plus with 3 hdc increases in the row should have 41 sts, not 40. Please help! I made a correction to the pattern. I had one short of starting CH. So sorry for the confusion. I followed this pattern so many times and never caught it until following the larger version a second time! Did you make the correction? Row 7 should be 41, not 40. Hmm… I wonder how this happened. I made the correction so it adds up to 40. I am following the pattern now to double check everything. I hope your adjustments helped prevent your dog from peeing on it! Hi! I made the Small one for my chorkie. I loved the pattern, but wondered if you had this pattern in bigger sizes. I have small, medium and an xl dog. I currently only have XS and Small. You slip stitch into the first stitch of the round. It joins so it’s no longer a flat/back and forth piece but working around. This is such a cute pattern. I’m going to make one for my sister’s mini doxie in neon hot pink. So she can see her in the Minnesota snow. One question though, I am familiar with a front post double crochet, but how is a front post single crochet done? Same way? Thanks much. Yes. The same way. The best thing about the front post single crochet is its AMAZING stretch. It is so great for edging on the neckline and even the bottom of hats and clothing. Yeah that will work. I need to re-follow this pattern again. I wrote out the size small one and thought I made all the corrections. Just make sure that when you get to the neck of the sweater, that you have an even amount of stitches. 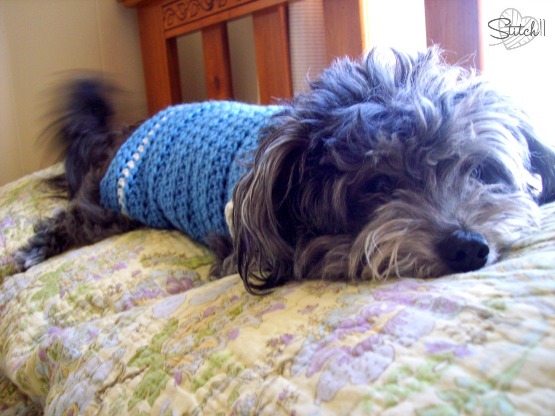 I have made several of these sweaters for my own dog. I love them.. I make him the small pattern. 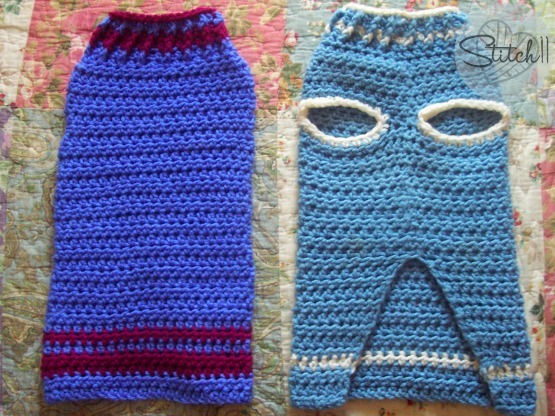 I made the same for a friend’s dog and it is a bit too small. Do you have a medium sized pattern? Or can you give me tips on making it larger? Quick question – is this in US stitches? Whipped up in one day! Easy pattern to follow. Thank you! My Cooper loves it! I was wondering if anyone knows of a crochet dog jumper pattern that will fit a Jack Russell of about 2kg (22pounds) ? You would use about a half skein of Red Heart or I Love This Yarn. I didn’t measure it in yards or I would give more detail. You will also need a 6.5 mm crochet hook. How much yarn will I need in order to make one sweater? Thank you. You would use about a half skein of Red Heart or I Love This Yarn. I didn’t measure it in yards or I would give more detail. Anyone know if there is a pattern like this but for knitters? Love this idea though! I made this for my Jack Russell but it isn’t wide enough between the leg openings. I am going to unravel and add some stitches. Just wanted to say Thank You for your pattern, I am a newbe at crochet, I can follow a chart but never a written pattern, but your pattern was so easy to follow, what I liked most is that you wrote how many stitches should total at the end, if it hadn’t been for that I would have quit. Thank you. I love this pattern for my small dogs. Do you have a pattern for bigger dogs? I made one yesterday and making another one today. Thanks so very much for sharing. Pattern is perfect. I am absolutely thrilled with your pattern!!! 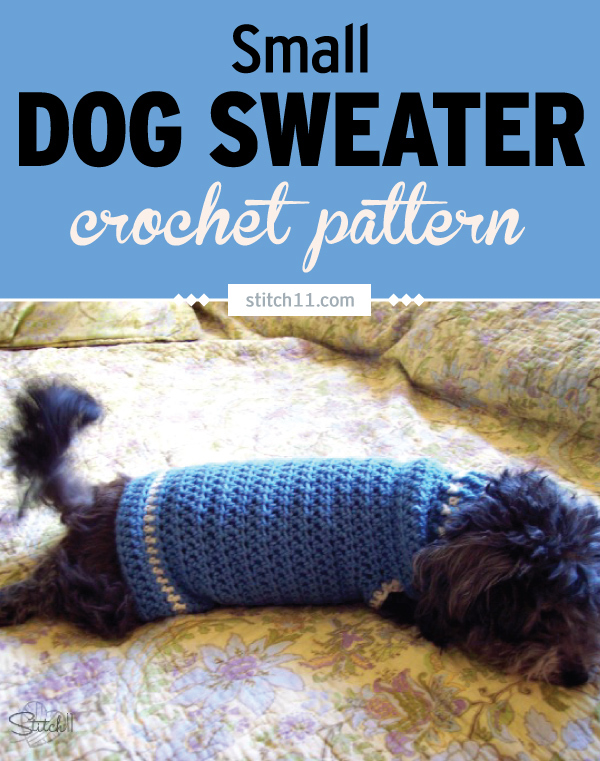 I have Dachshunds and its so difficult to find anything that fits them correctly, but your sweater pattern is perfect and easy to follow and adjust to my long dogs, lol. Thank you sooooo much. And my shivering girls thank you too. You will repeat from ** when directed in the pattern. What does hdc 2 together mean? Its a half double crochet decrease. Can you please tell me if this sweater is worked from the bottom up or neck down? Thanks so much! I’m new to crochet, im still confused at what the ** are for. It’s to mark what part of the pattern you will repeat from.